I can only imagine the energy in the tents at New York Fashion Week. 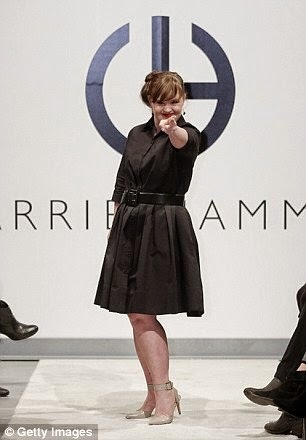 I bet fashion designer Carrie Hammer's show was even more exciting when Jamie Brewer stepped onto the runway. 30-year-old Jamie Brewer is an actress on American Horror Story, and she is made history last week as the first model with Down Syndrome to walk the runway at Fashion Week. Carrie Hammer has been known to feature real, inspiring women to showcase her custom-tailored designs. Models like Brewer are known as "role models not runway models." I say she's a role model AND a runway model. This girl's walk gives Giselle and Heidi a run for their money. This video on TV Guide's website says it all. Her graceful strut and facial expressions were truly modelesque. Congratulations to Jamie and Carrie for making history. Can't wait to see Jamie's next catwalk! Jamie is definitely an advocate for special people (like Emilie) to lead the way to much-needed changes in the world. PS - Thank you to my friends Andrea and Val for sharing Jamie's story with me on Facebook!